Source: ILO in Asia and the Pacific's flickr photosteam, used under a creative commons license. Even though overseas markets may posses substantial opportunities, these opportunities are coupled with risks of intervention by the host government. Today nations consists of different groups, each of which seek to maximize their individual interests. In countries where foreign investments plays a significant role in shaping economy, the goals of special interest groups frequently necessitate interference in the operation of foreign firms. "Political Intervention" can be defined as a decision on the part of the host country government that may force a change in the operations, politics, and strategies of a foreign firm. This intervention may range from some sort of control, to complete takeover or annexation of the foreign enterprise. 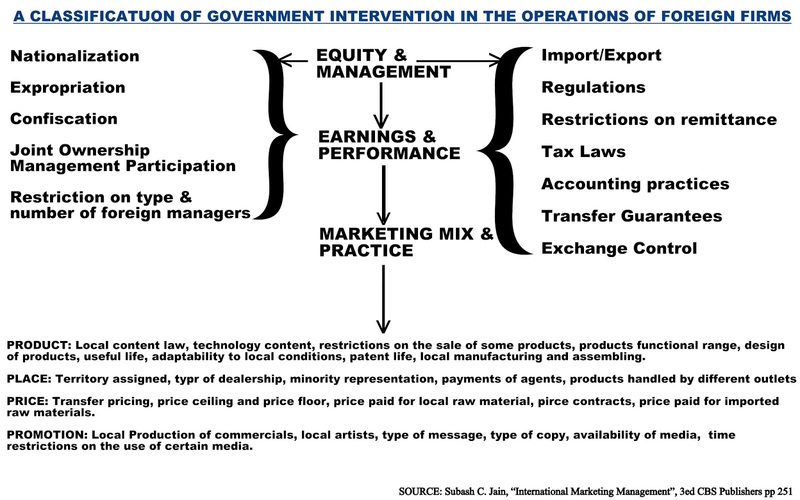 Figure Attribute: The above figure depicts the different ways in which governments may intervene in the affairs of foreign firms. 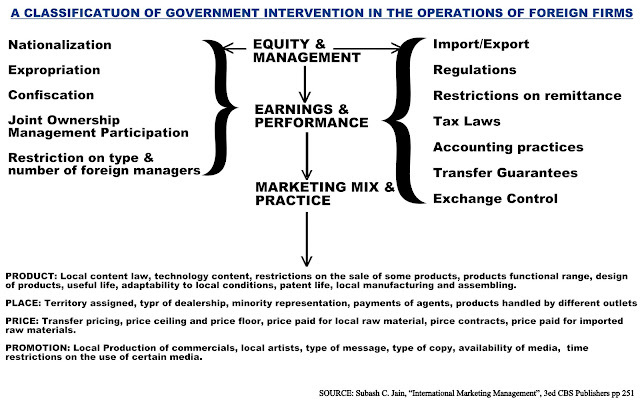 The figure also identifies the likely effects of political intervention on marketing mix variables. "Official seizure of foreign property by a host country whose intention is to use the seized property in the public interest. Expropriation is recognized by international law as the right of sovereign states, provided the expropriated firms are given prompt compensation, at fair market value, in convertible currencies." Other terms used interchangeably with expropriation are nationalization and socialization. Nationalization refers to a transfer of the entire industry within that country from a private to public ownership. Socialization, also referred to as communication, differs from nationalization in that it refers to a transfer of all the industries within the country. Expropriation without compensation is called confiscation. Expropriation patterns might vary according to the industry, geographic region, type of ownership, technology, degree of vertical integration, asset size and politico-economic situation. A study by the United Nations revealed that ten nations alone accounted for two third of all takeovers between 1960 and 1974. Included in the list are Argentina, Chile, Peru, Algeria, Libya, and Iraq. Domestication is a process by which controls and restrictions placed on the foreign firms gradually reduce the control of the owners. It may eventually lead to expropriation. In a way, this process offers a compromise to both parties. The multi-national corporation continues to operate in the country, mean while the host government is able to maintain control on the foreign firms through different restrictions and regulations. - Gradual transfer of ownership to nationals. - Promotion of a large number of nationals to higher levels of management. - Greater decision-making power accorded to nationals. - More products produced locally rather than imported for assembly. - Specific export regulations designed to dictate participation in world markets. Foreign exchange regulations are imposed by countries facing difficulties regarding their balance of payments. For example, in India import of luxuries from outside the country is restricted. Restrictions are also placed on remittances from India involving hard currency. These exchange control regulations are intended to encourage domestic industry. - Foreign business cannot return profit and capital to the parent company from the host country at will. - Cannot freely import raw material, spare parts and machinery for operating purpose. The exchange control regulations in most developing countries are meant to protect and regulate their hard currency balances. This in turn leads to restriction on the import of consumer goods (for example, cars, appliances, clothing, perfumes). Not only the developing countries, but even the developed countries, but even the developed countries resort to exchange control. Such measures were resorted by France in 1981 after the socialist government took over. Primarily, import restrictions are imposed to support the native industry. Generally, government legislate import restrictions for the entire industry, and not a particular company. Thus the difficulties likely to be faced by a foreign company do not figure in the discussion. When a country wants to encourage domestic industry as a matter of industrial policy, import restrictions are adopted with the realization that the local product will be inferior, at least initially. Strictly from the point of view of the government, import restrictions reasonable, but they jeopardize the function of foreign business. Sometime governments of certain countries impose restrictions on foreign firms to prevent them from competing in certain specified markets. A good example in this case is Japan's restriction on foreign firms selling sophisticated communication equipment to its government. Besides that, in Japan, the presence of exclusive supplier networks and alliances between domestic business organisations can restrict competition from foreign firms. - An unconventional tax burden on foreign firms indicates that they are not wanted there any longer. - When a country is in dire need of revenue inflows, it is quite possible that foreign firms will become the target of attack, since it is more economical, convenient and politically prudent to do so. - If the government comes to know that the foreign firm has abused differences in international taxation to deprive the host country of its due revenues, retaliatory, taxes can be imposed. Countries often resort to price control in the public interest when faced with economic difficulties. Even in a highly developed country like the United States, the price control weapon has been used many times. Many countries have resorted to price controls to improve their economies. For example, a government might set an official price on essential commodities or products such as drugs, heating oil, sugar, pulses, etc. This kind of control brings its own set of problems if its applied randomly. Further, the working of a foreign firm could be hampered if it has been singled out for price control regulations that are not based on a sound economic rationale. In many countries, labor unions are so strong that they may be able to negotiate terms with the government to pass very restrictive laws that support labor at a heavy cost to business. Labor unions in Latin America were once in a position to prevent lay offs, plant shutdowns and the like. Business could not afford to meet such demands. In recent times, labor unions have become stronger. For example, Germany and a number of other European nations require labor representation on the board of directors. 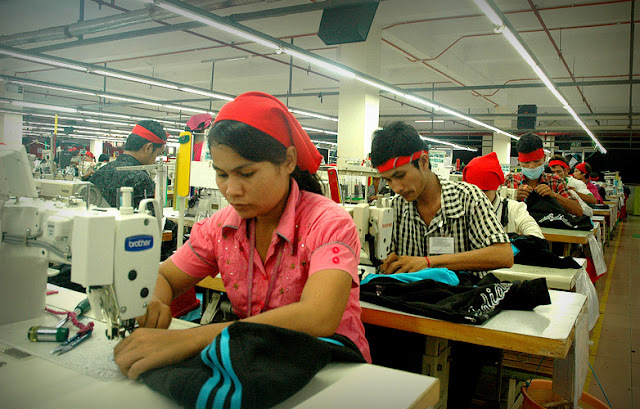 These kind of labor demands and laws can pose major problems for foreign enterprises. In such situation the foreign firm has no choice but to exit from the market itself.